Small and portable, no electricity needed, manual, easy to use, easy to clean is just some of great features which make this battery powered milk frothers one of the most important tools for brewing favorite coffee drinks at home or everywhere you go. 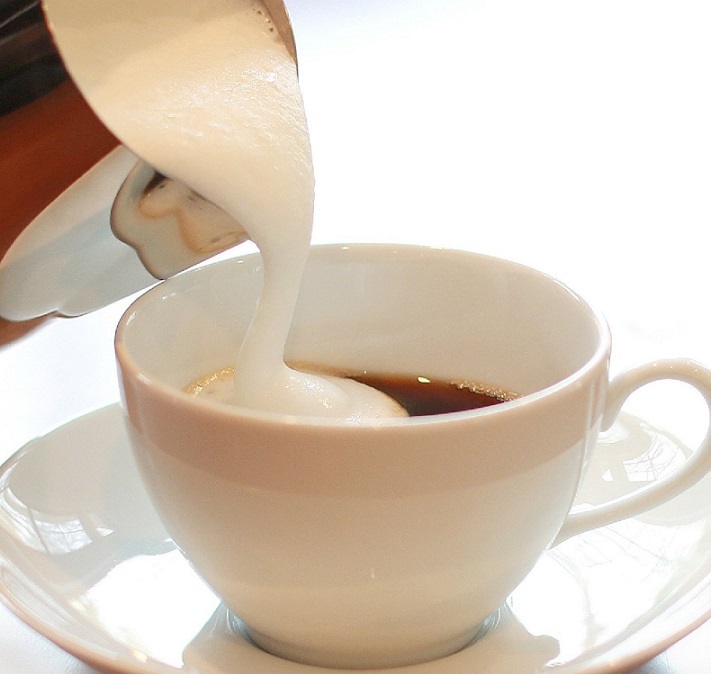 Milk frothers are a quick and effective way of making the perfect cup of coffee that you enjoy every morning. Their stainless steel finish makes them extremely durable and they are portable and easy carry along. These battery powered milk frothers are also very versatile with the different frothing heads that they come with and thus you will be able to fit them in a few different cup types. Why do we make a list of the best when the handheld milk frother is a very simple device? For most peoples it is simple device and all handheld electric milk frother is the same. If you do not understand the importance of the foam in making a perfect cup of coffee then this article about best handheld milk frother 2017 is not for you. Milk frothers are known for creating that creamy flavor and texture to cappuccino’s and other coffee drinks. If they are portable like this on our best lit they are very easy to use and also quite easy to clean and we have found that by leaving them in a bowl of warm water for a few minutes and then just rinsing them under cooler water directly after use will clean them perfectly. These battery operated milk frothers have been created to bring that perfect creamy taste to your home and thus saving you a few bucks every day when you are used to buying a cup at the coffee shop. You will also be able to serve the best coffee in the neighborhood and you can be assured that all of your guests will love the coffee. We have set out to find the most cost-effective and versatile manual milk frothers on the market and we gave them a few tests and decided on 5 best handheld milk frothers of 2017 that we believe will give you the best coffee or cappuccino’s on the market today. 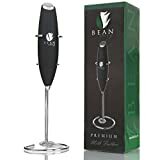 Some of them might be a little expensive, but they are truly durable and you will definitely receive great value hand held battery frother for your money. The best on our list is one of the most powerful and advanced foam makers. 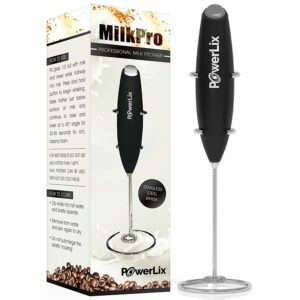 This PowerLix handheld milk frother has been designed to allow users speed when it comes to serving the perfect hot beverage. 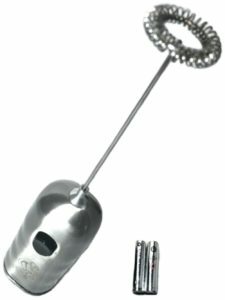 The portable frother has also been constructed from high quality stainless steel and this will make it very durable and also easy to clean in a hot tub of water. This battery powered frother offers a lot of versatility and thus it is easy to use by children as well with the one touch operating system. The 19000rpm will be great for making the perfect milkshakes and also lattes, now your children will be able to surprise you in bed with the ultimate hot beverage. Even though the power and speed output of the frother is double that of most espresso and cappuccino makers, the motor is still very silent and this means that you will be aloed to enjoy that perect cup of coffee late at night without waking the house. PowerLix is also operated using 2 AA batteries and we do not recommend letting the handle touch the water as it is not waterproof and it might cause some damage to the motor, but you will have the benefit of a 3 month money back guarantee if the item breaks or if you are not satisfied. 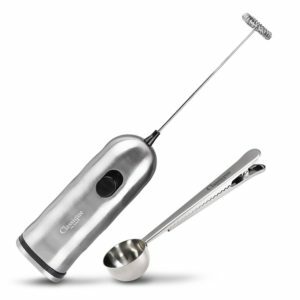 Inspired by the Café Casa, this manual milk frother is extremely versatile and durable. It features a strong stainless steel constructed frame that will never bend nor will it break and thus it can be great for the children to use as well. The frothing mechanism is small enough to fit into most cups and if you put it in a tub of hot water after use, you will find that it is easy to clean as well. The frother uses two AA batteries and thus it will be easy to replace once they are flat. The frother does not need any electricity and if you add rechargeable batteries, there will be no long term cost associated with the milk frother. Furthermore, the milk frother does have 2 different speed features that will allow you to thicken up the froth on things like hot chocolate, while keeping it thin on a cappuccino. These speeds are 13000 rpm and 15rpm and this faster speed will also offer you multifunctional use and you will be able to use this frother as a drink mixer as well. Finally, it is worth noting that you will receive a staggering 5 year warranty against manufacturer defect and this also shows confidence from the manufacturers in the durability of the product. The 1Easylife H422 stainless steel handheld milk frother is quite small compared to most of the competitors, but this can be an advantage to you. With this milk frother, you will be easily able to carry it to the table and serve those personalized cappuccinos to your friends and family. Even coffee shops and barista’s like to use this milk frother to add that essential creamy taste and texture to their coffees. 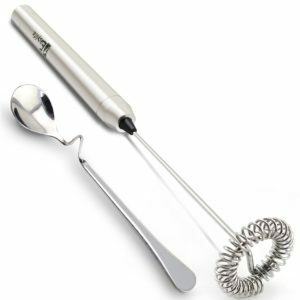 1Easylife portable handheld milk frother has also been created with a solid stainless steel construction that will not only make the milk frother much more durable, but it will also make the frother easier to clean. The frothing point is quite small and it will easily fit into most cup sizes and the entire item is powered by a couple of AAA batteries. These batteries will be the only long term cost. We definitely recommend this frother to people looking to entertain their guests. 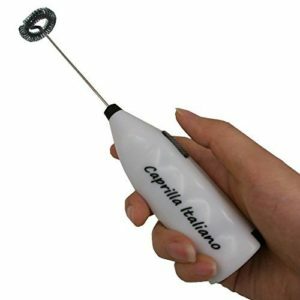 If you are addicted to the taste of froth on your coffee or latte, this frother is small and battery operated and thus it can be moved from place to place and even taken on holiday to ensure that you have the perfect hot beverage every day. One of the cheaper, but definitely the smallest and most portable milk frothers on the list, this milk frother will be great for travelling or quickly showing of your latte making skills at the table. The milk frother will turn you standard milk into froth in no time at all and depending on the thickness of the froth it could take anywhere between 15 and 20 seconds to get the perfect froth. This portable milk frother is waterproof and thus it will be easier to wash in soapy water, we still do not recommend putting the entire frother in the water, but if it happens, you will be sure that it won’t break. The handle is made from durable and insulated plastic, while the rest has been made up of durable and quality stainless steel. The platic is great for keeping rust off and ensuring that you have a lot more time to use the item and giving you value for your money. 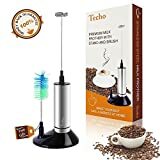 This handheld milk frother is good for people that like to travel and it will also perfectly fit in your bag or drawer when you are going to work. The milk frother is operated by 2 AA batteries and these have a longer than usual lifetime on this frother. You will also receive a 60 day money back guarantee when you are not satisfied with the product, but we believe it will meet all your needs. The classique elite milk frother is one of the more multifunctional products on the list and it is quite easy to operate. You will also receive an additional coffee scooper that will make it easier to get the correct servings and the item is really affordable. It has been created with a stainless steel frame that will make it extremely durable and the one touch operating system will even allow the children to whip together a few milkshakes of their own and you might not need the milkshake maker anymore. This milk frother features a dual speed setting with a maximum of 15000rpm and this is great for creating a creamy finish and taste for your cappuccinos and lattes, but the milk frother also has another use and that is the fact that you will be able to whip together a few sauces as well, giving you the ultimate culinary advantage when it comes to home cooking for your guests. The frother is quite small and portable and will be very easy to clean in soapy hot water, but we do not recommend putting the handle in water. Rather use a wet cloth to wipe it down. The frother is operated by 2 AA batteries and will be great for carrying a lon wherever you go. We would like to thank you for reading this article and we believe that you can now choose the best battery operated milk frother for your hot beverages. All of these milk frothers have been quality tested and they are guaranteed to give you a great quality beverage, but we also recommend looking for the handheld milk frothers that will give you multifunctional use as this will be better value for your money. In this table we give you more battery milk frothers that can offer good value for money and easy meet your needs. We would like to encourage you to let us know how you like to make the perfect froth for your coffee and we are sorry if we in our list best handheld milk frother 2017 have missed any other manual frothers that are of the same quality and meet these standards at affordable prices.